I have been thinking about eating light and simple meals these days. Today, i wanted a ZERO OIL dish for lunch and i started hunting for ideas. For many people, that means a non palatable dish. People associate oil with taste but that is a big myth. Zero Oil does not mean that you have to eliminate fun and taste from your meals. Thinking in that direction, i began to think of all the factors of food that makes it interesting and appetizing. One thing that struck me was the colorful vegetables. Keeping that in mind, i decided to dedicate this post to those beautiful produce and create a dish which you would “want” to eat. So, here it is ! 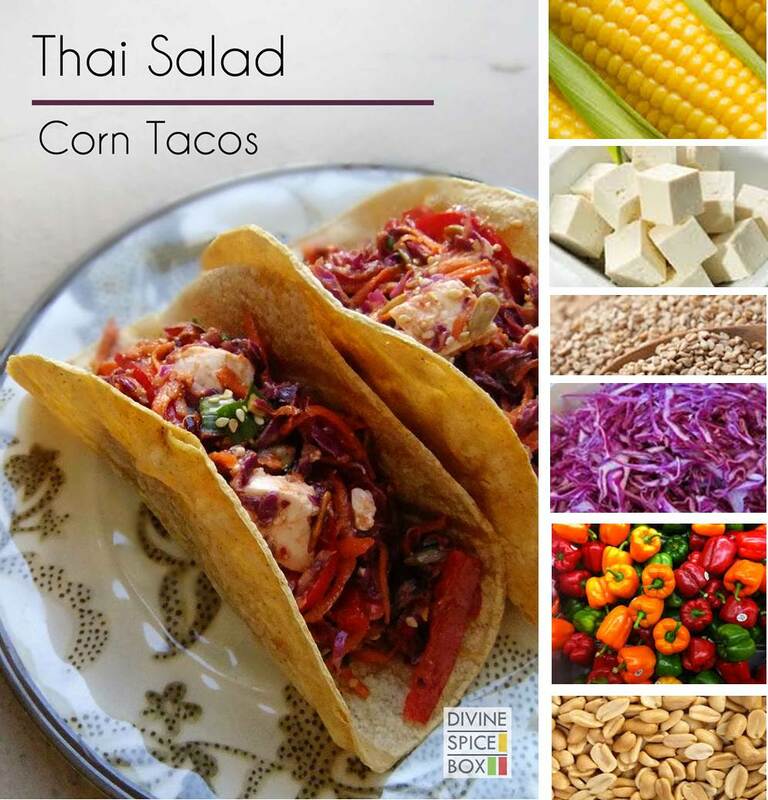 Thai Salad with crunchy corn Tacos. Yummy right? The concept was inspired by an Indian appetizer dish called as the “Masala Papad” where lentil crackers are laced with fresh tomato onion salsa. Read the recipe below and make it at home today ! This dish is made with corn, cabbage, peanuts, sunflower seeds, tofu, sesame seeds and bell peppers. We will begin with preparing the tacos from the tortillas. If u like, you can also buy corn tacos from the store and go ahead with the step 3. Pre-heat the oven at 365 F. Place the tortillas in a U formation between the gaps of a muffin tray and bake for about 7-10 minutes till the “U” shape retains. Remove from the oven and let it cool down. The corn tacos are ready. We will begin the Thai salad with the dressing. For that, put all the ingredients for the dressing in a mixie/food processor and make a smooth paste. In a bowl, put in bell peppers, carrot, cabbage, spring onions and tofu. Pour in the dressings on top of the salad mix and toss well using 2 forks. Sprinkle coriander, sesame seeds and sunflower seeds on top and combine. The thai salad is ready. 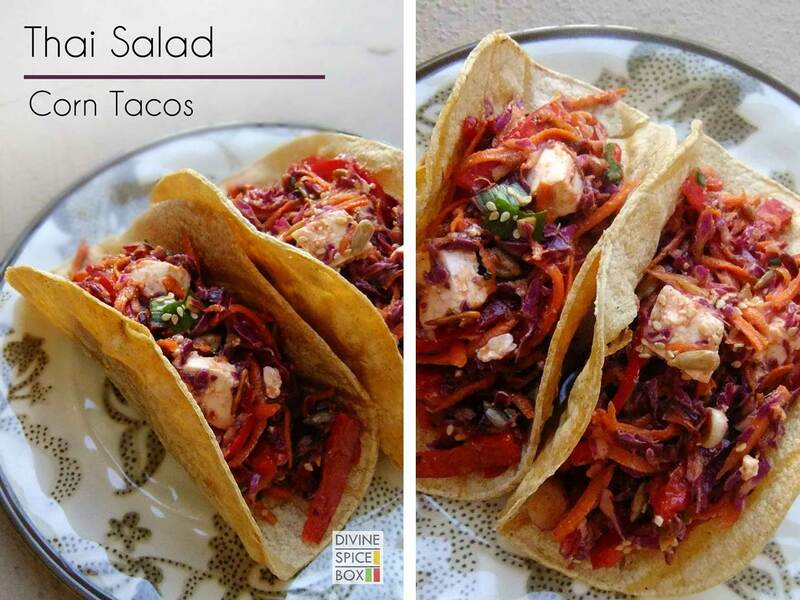 To serve, place 2 tacos on a plate and fill them with the Thai salad. Serve immediately. Isn’t that a superb way to eat some veggies and keep it raw and real ? I love the colors of this dish.. You know how the saying goes ” You are what you eat !”. With these rainbow like color palate for lunch, i am more than happy to think of all the goodness it contains ! Tagged coconut, easy, fusion, Healthy, MeatlessMonday, Quick, Salad, simple, Summer, Thai.